Left: Zeynalabdin Taghiyev (1838-1924) is the Oil Baron who is remembered for his generous philantrophy. Although he was not the wealthiest Oil Baron, he was considered the most generous. Tagiyev was involved, among other projects, in building schools, theaters, and helping to solve the water crisis in the city by helping to finance the Shollar water pipeline, which channeled water 100 miles away in the Caucasus mountains via ceramic pipeline. This water system is still the most reliable and pure water supply in the city today. Taghiyev's residence, which takes up an entire city block, is truly palatial in design and truly has the most complex artwork of any of the buildings in the city. One must not forget that Taghiyev never had the chance to go to school and could neither read nor write. The Bolsheviks confiscated Taghiyev's property in 1920 when they took control of the city. Fortunately, they did not destroy all of the interior of his residence. Instead, they used it to house the National History Museum. Taghiyev's residence took nine years to complete. Date Built: 1893-1902, meaning that construction was extremely long, possibly the longest in existence in Baku at that time. However, the superb details of the interior clearly warranted such attention. In 1873, Taghiyev along with two partners [the Sarkis Brothers] rented a plot of land in Bibi-Heybat [one of the first places in the Baku region where oil was discovered]. They hired workers, bought the necessary equipment and started drilling for oil. Eventually, Taghiyev's partners gave up and sold their shares to Taghiyev. His persistence paid off and his efforts were rewarded with a gusher. Such is "the rags-to-riches" story line of how Zeynalabdin Taghiyev, son of a poor shoemaker, became a millionaire, one of Baku's most prominent Oil Barons. The Italian Renaissance-style mansion is immense and takes up an entire city block. There are four floors in some parts of the building. It was designed by Polish architect Joseph V. Goslavski, who later worked on Baku's City Hall and Taghiyev's boarding school for Azerbaijani girls, which today houses the Institute of Manuscripts. 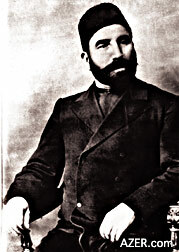 When the Red Army entered Baku in 1920, Taghiyev refused to leave the country though most other wealthy entrepreneurs fled immediately and established themselves in Europe. Others committed suicide or were exiled or killed. Taghiyev was in his late 90s at the time and decided not to leave the country, convinced that he had done so much for the country as a philanthropist that no one would dare harm him or his family. To this day, Taghiyev is esteemed as the most generous of the oil barons though he was not the wealthiest. When the Bolsheviks took over the city in 1920, Taghiyev's residence - like that of other wealthy oil barons - was immediately confiscated. Taghiyev was given permission to leave the city and to move to his summer home in Mardakan, a suburb of Baku, down by the sea on the Absheron Peninsula. Because Tahigyev's mansion was so elaborate, there seems to have been a real desire on the part of the Bolsheviks to preserve it as a showpiece. Under a resolution of the USSR People's Commissariat, the residence was established as a museum in June 1920, only a few months after the Bolsheviks took Baku. The exterior of Taghiyev's residence is not nearly as impressive as its interior. In fact, it's easy to ignore this building if you base your decision upon the façade alone. Don't do that. When the museum reopens, the Taghiyev Museum should be at the very top of everyone's list of places to visit in Baku. If you have a chance to see only one Oil Baron mansion in Baku, this should be the one. Be sure to visit the second floor. Side by side are two major ballrooms. One is based on Oriental designs (Mauritanian) style and the other, on Occidental design. The Oriental Room has enormous plate glass windows, gilded arches, highly ornamental walls, ceilings and chandeliers. The lines in the Occidental Room are more perpendicular to each other - rectangular. The majority of spaces in the Taghiyev Museum have been closed off to the public. In the past, these rooms, had very elaborate furnishings. Today there is nothing except windows, doors, parquet floors and ceilings. According to photographs that are about 90 years old, one of the most elaborate rooms was Taghiyev's wife's boudoir (private sitting room). All of the moveable furniture and paintings in this room have disappeared. Nothing remains today except the ornate mirrored mosaic ceiling. During the Soviet period, four layers of white paint were applied over the highly decorative floral designs on the walls. Still in the main halls of the residence, the original paint has withstood the passage of time incredibly well. The paint was made of finely ground egg shell as was the practice of artists of Byzantine icons. Nearly 100 years later, the original colors with their subtlety and sophistication have neither faded nor chipped. Hopefully, many of these rooms once closed to the public will once again be opened, giving the visitor insight into an era long past. Visit: Tel: 493-3648. However, the building seems to be closed for an indefinite time, possibly as long as two years. Major renovation is being carried out.